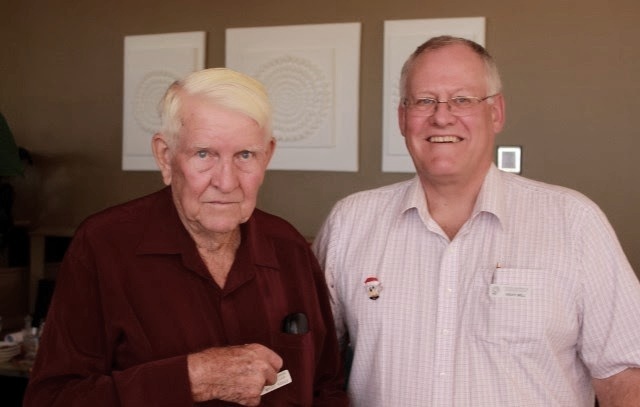 It is with great sadness that Coffs Harbour Garden Club this week farewelled one of our long-standing and highly valued members in Myles Roser. Myles joined the Garden Club in 1992, and his wonderful service to both our Club and the Coffs Harbour community in general was widely acknowledged and appreciated. Myles was a true gentleman, an excellent gardener and a wonderful contributor in so many ways. Myles received the Garden Clubs of Australia Ann Williams Clark Medallion in December 2013. The award citation outlined Myles' involvement in the CHGC particularly well, and so I thought it would be nice to repost it in full so that all our members can reflect on his wonderful contribution. Myles Roser is the quiet 'behind the scenes' man in the Coffs Harbour Garden Club and in the 20 years that he has been a member he has been totally involved in the life and activities of the Club. If something has to be done, then Myles is your man. Over the years Myles has stepped in to fill the roles of absent members and was the Catering Officer for some years. He is a Club representative on the Coffs Harbour Show Pavilion Committee, where the Garden Club is responsible for staging and organising the Plants, Flowers and Vegetable Section in the Show Pavilion. He is also one of the co-ordinators organising the displays of Craft, Horticulture, Agriculture, Cooking and Schools exhibits and attends regular meetings and working bees of the Pavilion Committee to prepare, plan and maintain equipment and fixtures used in the Show each year. He is an indispensable helper at each meeting, as he is one of the first to arrive and set up the meeting room organising the tables and chairs, setting up the library and the Trading Table, filling the urn and making sure the tables are set up for Afternoon Tea. He directs visitors to the Attendance Book and the Competition Table and welcomes them to the club. He has at times been responsible for the 'Hint of the Month', and presented the 'Gardener's Diary' for many years. Myles is an inspiration to our members for his dedication, his active participation in the life of the Club, his sense of humour and his ability to share knowledge and skills. When anyone has a practical gardening question Myles is the first person they ask. Through his activities at the Show he is continually promoting our Club in the Community and encourages gardeners to join our club. He was also the chief organiser of our fund raising BBQ's each year, purchasing all the supplies and even peeling 20 kilos of onions each time (!) and is an indefatigable worker at all the other events that the Garden Club participates in every year. He is also famous for his sandwiches, which he supplies on many of our outings and club events. Always involved in the Annual Garden Competition as a driver for the judge, he encourages other members to accompany him so that they can become familiar with this task and take over in the future. He is always concerned that as many people as possible are given the opportunity to learn and be involved. Myles opens his garden twice a year to promote the Village where he lives and has invited our Garden Club and Garden Clubs visiting Coffs Harbour to see his garden and loves to give plants and cuttings to anyone who asks, especially plants that he has propagated himself. Myles in his acceptance speech, said that Rhona Brooks, Coffs Garden Club President in the early 1990's noticed the Roser's beautiful garden and encouraged Myles and Pat to become members of the Club. This was the commencement of their journey with CHGC. Myles went on to add that there have been many notable events and activities during his 20 year involvement and he has enjoyed all aspects of being a club member. It is testament to this attitude that the CHGC nominated such a worthy recipient for this award. Even when he received this award he made mention of the importance of team work and encouraged any new members to get involved as it was a wonderful stepping stone to making solid friendships with like minded people. Myles has been Pat's backup every step of the way. During the time that Pat held (and still is) positions on either the Executive or as a Sub-Committee member, Myles would wholeheartedly support her in any way possible. I have to agree that his 'sangas' were legendary and he seemed to make them so effortlessly and with great cheer for meetings, outings and at the Coffs Show. He was generous in sharing his knowledge and actively encouraged people to participate within the club and community. Myles Roser you have been a wonderful CHGC member and will be sorely missed. May you Rest in Peace. What a Day for an Outing!